Whilst modelling literal anatomical or engineering constructs is not new, modelling the ‘abstract’ is underexplored in higher education. 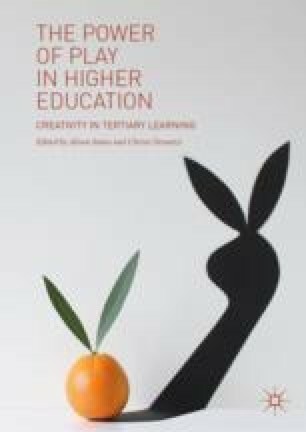 This piece explores the potential of metaphorical model making using Play-Doh® as a multi-sensory approach to learning development in higher education. The approach is underpinned by Papert’s Constructionist learning theory and is sympathetic to visual and kinaesthetic learning preferences. Workshops were conducted with groups of Health Science students, the aims of which were to allow the students to use concrete thinking to explore key concepts in their work through the creation of and reflection upon representational models. The findings highlight the importance of celebrating differences in learning styles and have led to further developments to the approach with other student groups for a variety of personal and academic development purposes. Ackermann, E. K. (2004). Constructing Knowledge and Transforming the World. In M. Tokoro & L. Steels (Eds. ), A Learning Zone of One’s Own: Sharing Representations and Flow in Collaborative Learning Environments. Available at http://jotamac.typepad.com/jotamacs_weblog/files/Constructing_Knowledge_Ackermann2004.pdf. Accessed May 30, 2018. Brown, S. (2009). Play Is More Than Just Fun. TED Talk. Available at http://www.ted.com/talks/stuart_brown_says_play_is_more_than_fun_it_s_vital. Accessed June 16, 2017. Coughlan, S. (2015). Rising Number of Stressed Students Seek Help. BBC News. Available at http://www.bbc.co.uk/news/education-34354405. Accessed May 30, 2018. Department for Education. (2017). Inclusive Teaching and Learning in Higher Education. Available at https://www.gov.uk/government/publications/inclusive-teaching-and-learning-in-higher-education. Accessed June 21, 2017. Gray, P. (2013). Play as Preparation for Learning and Life. The American Journal of Play (Spring). Available at http://www.journalofplay.org/sites/www.journalofplay.org/files/pdf-articles/5-3-interview-play-as-preparation.pdf. Accessed May 30, 2018. Marsh, S. (2017, May 23). Number of University Dropouts Due to Mental Health Problems Trebles. The Guardian. Available at https://www.theguardian.com/society/2017/may/23/number-university-dropouts-due-to-mental-health-problems-trebles. Accessed May 30, 2018. Papert, S., & Harel, I. (1991). Constructionism. Available at http://www.papert.org/articles/SituatingConstructionism.html. Accessed February 16, 2014. Ready Set Design. Available at http://cdn.cooperhewitt.org/2011/09/02/Ready%20Set%20Design%20vX.pdf. Accessed June 21, 2017. Robinson, K. (2006). How Schools Kill Creativity. [ONLINE] Available at http://www.ted.com/talks/ken_robinson_says_schools_kill_creativity.html. Accessed December 2017. Yeung, P., Weale, S., & Perraudin, F. (2016, September 23). University Mental Health Services Face Strain as Demand Rises 50%. The Guardian. Available at https://www.theguardian.com/education/2016/sep/23/university-mental-health-services-face-strain-as-demand-rises-50. Accessed May 30, 2018.